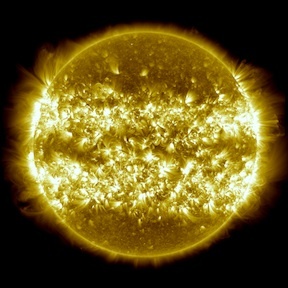 The "Three Years of SDO Images" shows two bands of bright coronal loops in the 171 time-lapse image. Several people have asked whether this is real. Yes, it is real and it is caused by how sunspots form on the Sun. We have seen that sunspots tend to occur below 35º latitude in both hemispheres of the Sun, just as you noticed. This gives us the Butterfly Diagram shown here for for sunspots since 1965. 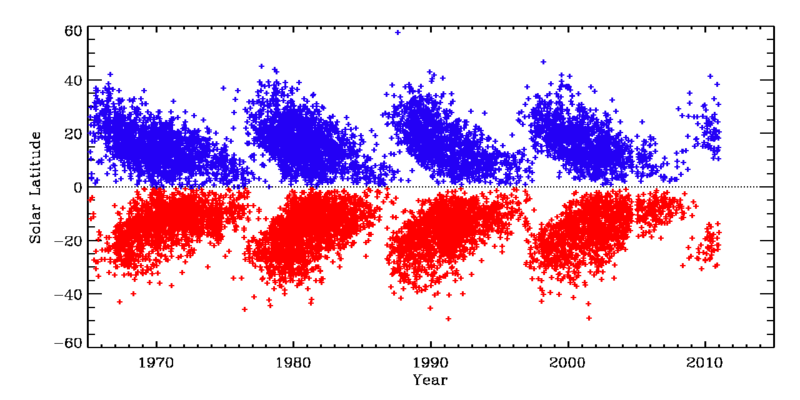 Northern active regions (or sunspots) are shown in blue and southern in red. A few regions appear at higher latitudes, but most sunspots are seen at low latitudes. Sunspots also tend to occur closer to the equator as a sunspot cycle moves along. They don't usually form at the equator, but the tilt of the Sun can make that difficult to verify. The coronal loops in the time-lapse image follow this pattern because they live above sunspots. Although few sunspots and coronal loops are seen in the polar regions, prominences and coronal holes are seen there. We do not have a perfect explanation, but it comes from how material moves in the convection zone and how that movement creates magnetic fields. This is called the solar dynamo problem. Perhaps the explanation will be similar to why we have the Horse Latitudes here on Earth. Produced by Scott Weissinger, looks great! HMI has returned to normal operations. The HMI team at LMSAL and Stanford will closely monitor the instrument to verify its performance. We don't anticipate any more outages. 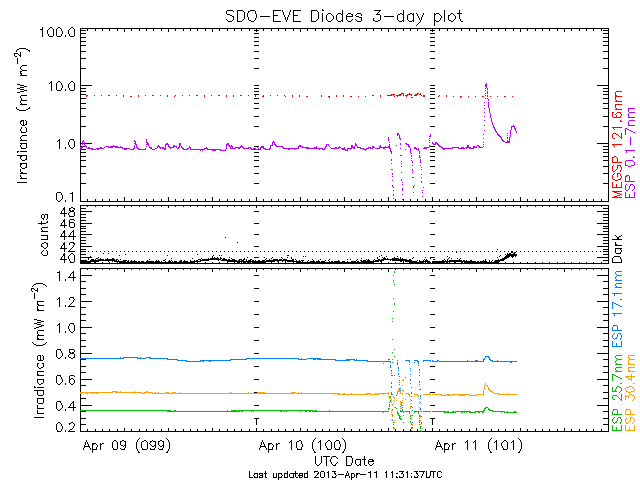 Data is flowing to the JSOC but it will take a while to prime the pump and produce magnetograms and Dopplergrams. Thanks to Jake, Rock, Zoe, Gary, and the other people who brought HMI back! Last night the HMI instrument rebooted and stopped producing science data. The HMI team has made sure the instrument is safe by rebooting and testing HMI. They will restart the science sequencer later today. HMI data will not be available until the sequences are restarted. Many thanks to the LMSAL and Stanford people who worked through the night to reboot and test HMI! 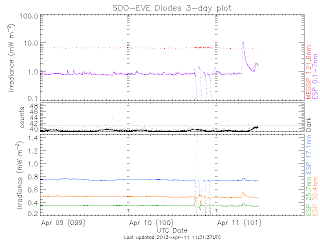 Today, starting at 1315 UTC (9:15 am ET), SDO executed the EVE Field of View maneuver followed by the HMI/AIA Flatfield at 1630 UTC (10:30 am ET). During these maneuvers the science experienced interruption, and some of the browse images reflect the motion of the spacecraft. We are experiencing a system outage that is interrupting the automatic web updating of SDO images. The spacecraft is still fine and is collecting data as usual, and no SDO data has been lost. The outage is on the ground and is only temporary. We apologize for any inconvenience, and we thank you for your patience. After weeks of little activity, the Sun erupted with an M6.5 class flare today. At 0711 UTC (3:11 am ET) active region 11719 erupted. AR 11719 is a large area of magnetic field located at 10°N. Another small flare followed as the M6 decayed. Today at 1800 UTC (2 pm ET) SDO will execute an EVE cruciform maneuver. SDO will nod back and forth and up and down. These motions allow EVE to calibrate their spectral irradiances. Today we ran an HMI roll maneuver from 0550-1230 UTC (00:40-7:30 ET). The entire SDO spacecraft is spun around so that HMI can verify its operation and measure some calibration data.